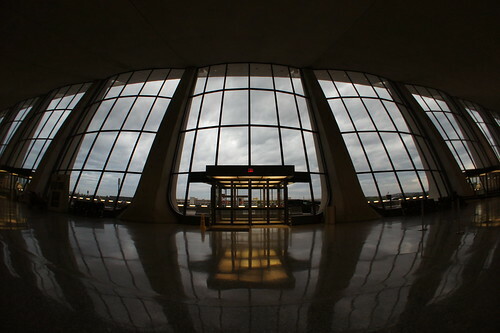 I was at Dulles for a while that Friday. I had come over early from work to enroll for TSA Precheck, and tried driving in via a back route called “Ariane Way” that skipped the Dulles Access Road and was frequented by airport workers and cargo delivery trucks. A wrong turn somehow trapped me in the taxi lot, where I managed to U-turn into a one way lane right into the headlights of a rental shuttle before finding my way out to the terminal ramp, much to the amusement of the entire Dulles taxi fleet. 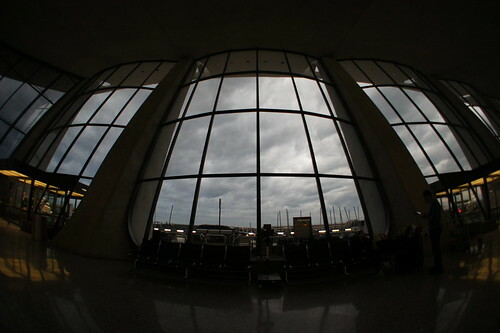 With my spare time between TSA enrollment and boarding, I pulled out my fisheye lens and tried capturing parts of the famous Eero Saarinen terminal. The fluorescent-lit exit bays glowed a greenish-yellow against the stark gray of the clouds outside, casting a dull glow somewhat reminiscent of the diner in Hopper’s Nighthawks. 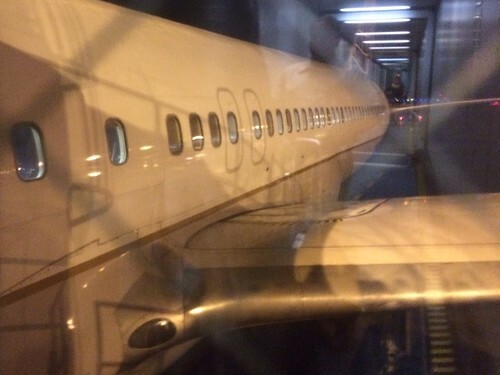 It was a smooth flight to Orlando. This was my first time flying with an electronic boarding pass, and at no point did the QR code on my iPhone Passbook app present any difficulty. The flight left on time, and my nighttime view from the window seat was marked by the lights of East Coast cities passing below, and flashes of lightning from distant thunderstorms on the horizon. 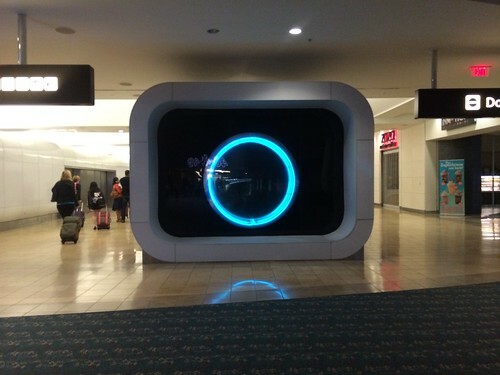 It took a while to get out of Orlando International Airport. Long line at car rental, long walk to a locked Mazda 3 without a key, long walk back to the rental counter, where I was upgraded to a Nissan Altima. By the time I got to my hotel it was past 3AM. At least there was no traffic on the 528.